Statz rings are an awesome stocking stuffer or a great gift from one teen to another! I wish they had these about when I was a teenager. Then I could have known what his status was before taking the sometimes embarrassing plunge to ask. Or the boys can wonder who you're crushing on! Endless fun and possibilities! Ever wanted a way to tell the real world what your relationship status is? Now you can! Statz are a fun, colorful way to bring your relationship status to life! Each color stands for a different status in your relationship. Green = Single, Red = In a Relationship, Orange = Crushin', Blue = It's Complicated and Black = Noneya Business. What's YOUR Status? These plastic, brightly colored rings come in the five colors pictured above. They also come with a heart shaped ring that is easy to clip on belt loops, backpacks, purses, wallets and more, so that they are easily accessible for when that status changes! These rings are very durable and the color hasn't faded in the least from wear. 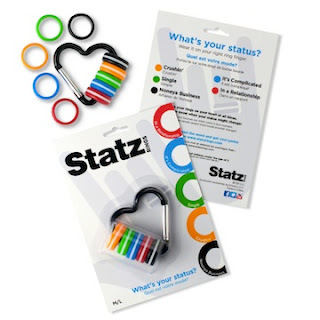 Be the envy of your friends with your statz rings! One lucky reader will win a package of Statz! Cute Idea! I know many of my Facebook friends who could use one for unstable! I see their relationship status change weekly! Never heard of these..cute concept. really cute Idea.. Thank you for sharing.. Cool giveaway! Different and fun! Thank you for this cute giveaway! I know the perfect person for this! Thank you for the chance to win! Really cute idea! Even cooler that you're offering a giveaway :) Thank you for this opportunity! How cute! What cool rings!